About My Cauliflower | EAT MY PLANTS! The Cauliflower seeds I bought from High Mowing Seeds are of the Snowball Y Organic variety. Dense, smooth curds on 6-7″ heads, these are mature in about 70 days. This is my first season growing Cauliflower and I’m not off to a good start. Like the Broccoli, this is a Fall variety that I purchased. I guess we’ll see how well it does in the Spring. I still have seeds left to plant in late Summer though. That’s the up side to this. The last post I wrote showed a picture of just a couple of plants that came up. They should have come up along with the Broccoli and Cabbage, at least within a few days. These had not come up for an entire week or more afterwards. I think the shed was too cold for them. I don’t have a heat source out there, though with the lights and keeping the shed closed, it’s much warmer than outside. I’m pleased to say there’s a few more that have come up, but I’m unsure what the cold germination period will do to the plants. Some garden friends of Cauliflower, plants that make good companions and can share garden space, are Beet, Bush Bean, Carrot, Celery, Cucumber, Dill, Kale, Lettuce, Mint, Nasturtium, Onion Family, Potato, Rosemary, Sage, Spinach, and Tomato. You should avoid sharing space with Pole Bean and Strawberry. If you’re going to see Aphids and Flea Beetles attacking the Cauliflower, it will likely be in Spring. Cabbage Maggots, or Root Maggots, should come as no surprise, since Cauliflower are in the Cabbage family, are also a potential problem. In fact, more common than others. Be aware of Caterpillars, like Cabbage Loopers, as well. Cauliflower needs Nitrogen and Potassium rich soil with a good amount of organic matter to retain moisture. 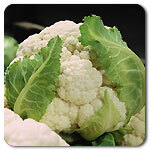 This plant needs regular watering and can’t be allowed to go dry between watering or your Cauliflower will get ricey. Plant the seeds 1/4″ to 1/2″ deep in soil that’s 70 degrees. (That’s where I failed.) This is why these make a better Fall crop in colder areas like my part of the country. If necessary, use a heat pad under the flats you’ve planted. Carefully harden plants off before transplanting them. When placing them in the garden, give them 15″-24″ spacing and be careful not to disturb the roots when weeding. To help keep the area moist, consider creating a saucer shaped depression in the soil where the plant is to help retain moisture. Try to maintain a pH between 6-7 and feed with fish emulsion every couple of weeks. The plant will be mature and ready for harvest in about 45-98 days depending on the variety. My variety, SNOWBALL Y, is mature in about 70 days. Varieties of Cauliflower will be anywhere between 6-12″ across. The SNOWBALL Y that I am growing is 6-7″. When the heads reach full maturity, using a sharp knife, cut just below the head along with a few leaves to protect the curds. Use them right away or preserve them. In fact, if you’re not going to use them, you can leave them in garden until the first freeze. They’re fine as long as they don’t freeze and thaw again. Once they freeze, cook them. Last season, with the Cauliflower I received from my weekly shares at Thorpe’s, I blanched and froze the trimmed heads. I still have 2 bags left in my freezer right now. That’s awesome. Well, as you can see I’m off to a sad start with the Cauliflower just like the Broccoli. I’m a musician first, gardener second. (Obviously.) I am happy with the seeds I got from High Mowing Seeds, thanks to Mother Earth News. These seeds are not treated or “dressed” with any chemicals. I recently researched what seeds are typically treated with since I wasn’t sure why I even buy organic seeds. I just do. Seeds that are dressed are mostly dressed with antimicrobial and fungidal dust and in less common instances, a pesticide. I don’t know if herbs are included in that same treatment yet. I’ll do more research and do a post about that another time. What have you done wrong in your garden? Any mistakes already? I’d love to hear about it. Maybe I can learn a thing or two from you. If you have any suggestions I want to hear those more than anything. Tips and tricks would be great. I’ll continue to share whatever I can.